The workplace of today is drastically different than any that has come before. Advances in technology combined with more casual work practices have given rise to the concept of “bleisure”. The lines between work and leisure are increasingly becoming blurred, and it seems that the workplace leaders of today, the tech giants, are creating a more diversified workforce. 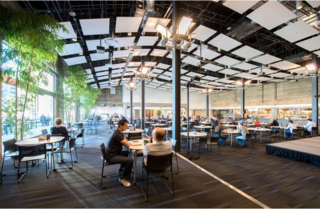 Tech giants like Google, Twitter and Facebook are seamlessly integrating social spaces with work spaces. As business mixes with leisure, how exactly are these tech giants changing the way in which we work? “Bleisure” is an emerging buzzword in the world of business and is a combination of business and leisure. Young, exciting tech giants like Google, Twitter and Facebook have embraced this concept, and their global dominance and success is changing the way in which we traditionally view the office. This infographic from AllSystems gives a visual representation for the term, and is the source of the stats shared in this article. The workplace is rapidly changing, and 60% of senior business people believe that “work is shifting more towards an experience than a place”. 86% believe the most successful companies are those willing to harness the benefits of transformation. While 8 in 10 said the rise in the “anytime, anywhere” work trend is inevitable. The writing is on the wall, and it seems that “bleisure” isn’t going anywhere any time soon. Who are the champions of “bleisure”? The Google way of working was revolutionary for its time, and continues to befuddle traditional executives today. 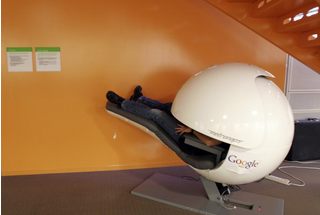 If you walk into Google’s headquarters, in Mountain View, Calif., you’ll see that everyone is dressed casually, it is impossible to spot a senior management professional from the crowd. The site at Mountain View is lauded for its comfortable and unusual features. 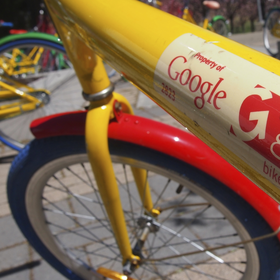 Among these many aspects Google’s headquarters is home to a real dinosaur, cupcake sculptures, multi-coloured bicycles for intra-campus transport and a free, well-stocked cafeteria. Anthony Ravitz, the leader of the “Green Team” in Google Real Estate, explains that what appears to be whimsical and fun at Google is born from data-driven decisions to achieve a more efficient workplace. “We are after the holy grail for the knowledge industry; how to measure productivity. That isn’t just how quickly you can type words, or how well you made a line of code. It’s about how you felt about it, and whether you had enough energy to play with your kids when you got home” explains Ravitz. Google’s famous free meals were introduced to negate the inefficiencies of an ordinary paid cafeteria. Carefully hidden behind lightweight screens are “nap pods” where people can catch up on sleep in enclosed silence. 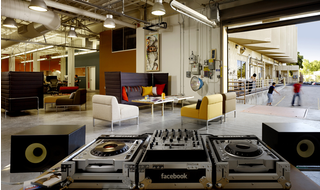 The Facebook campus is a cluster of 11 buildings enclosing a pedestrian square and a two-way promenade. The complex has a cupcake store and a barbecue joint, a wood shop, a print shop and an arcade. In addition, there are two cafeterias, a candy shop, a taco stand, a burger stand, a pizza stand, a chopped-salad bar and three small restaurants. The traditional conference rooms are eschewed for trendy spaces, and even walkways double as spaces for off-the-cuff meetings. The idea is that meetings and decisions are held and made on the go so they are short and conclusive. When it comes to Twitter, everything is short, snappy and stylish much like the 140 character micro-blogs the network is known for. Twitter’s cafeteria is called @birdfeeder evoking images of the company’s avian logo and the trademark ‘@’ symbol users on the site utilise for their chosen monikers. While @birdfeeder is a cafeteria area, employees spend much of their time here aside from eating, working on laptops and phones. A communal area of couches and cubes, with cushions that say “Home Tweet Home”, serves as an impromptu meeting area. The company encourages informal meetings in this low-stress setting, hoping that it will help foster new ideas. How do today’s graduates see the office of the future? The millennial generation is different to every generation that has come beforehand, and have drastically different views to the modern workplace than graduates would have had even 10 years ago. Three in every four graduates believe the nine-to-five office culture will end, while 76% expect greater flexibility to prescribe their own working hours. 68% believe that virtual networks would result in greater employee engagement and higher productivity, which “bleisure” facilitates.